Skyway Systems are very popular in urban areas. It is also known as catwalk, sky bridge or skywalk. The main core purpose of the construction of skyways is to protect the pedestrians from bad weather. Skyway systems are usually incorporated in private businesses. They are not seen in public spaces. Skyways Systems could be very well be used in a University Campus. The blocks in the campus are interconnected with each other by constructing bridges connecting the two blocks at one or more levels. These are called Skyway Systems. If the height of the skyway exceeds 6m, it is termed as skybridge. The Petronas Towers are connected with each at a great height via sky bridge. It plays a significant role in connecting the two towers. Commercial establishments like shopping malls can be very successful if skyway systems is to be incorporated in the design. Non commercial areas including University campuses can have skyways as well as Underground tunnels. Connecting various blocks in the University campus through skyways is an excellent idea. It would help students move around into various blocks without having to get out of the building block to get in to an adjacent building block. The world’s largest skyway network – Calgary, Alberta’s “+15 Walkway” system – has a total length of 16 km (10 miles). However, the system is discontinuous, and it does not connect every downtown building. Minneapolis Skyway System is the largest skyway system in the world is compared to the underground cities of Canadian cold weather cities Toronto and Montreal. The system forms a network of climate-controlled, pedestrian walkways that link sixty-nine full city blocks over seven miles (11 km). 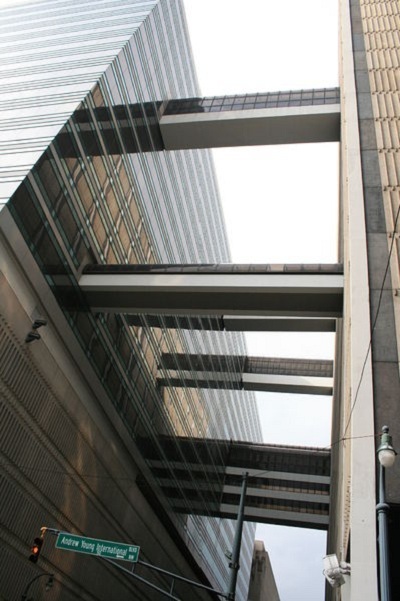 The skyways are owned by individual buildings in Minneapolis, and as such they do not have uniform opening and closing times. Another large skyway system is being constructed in Mumbai, India. It is a discontinuous system of 50 skywalks planned in Mumbai Metropolitan region. The length of each skywalk is 1 to 2 km. When completed, the system will be the largest skyway system in the world. The first of these is a 1.3km (0.8mi) long skywalk connecting the suburban regions of Bandra and Kurla. This entry was posted by Benzu JK on March 24, 2011, 7:21 am and is filed under Architecture. You can follow any responses to this entry through RSS 2.0. 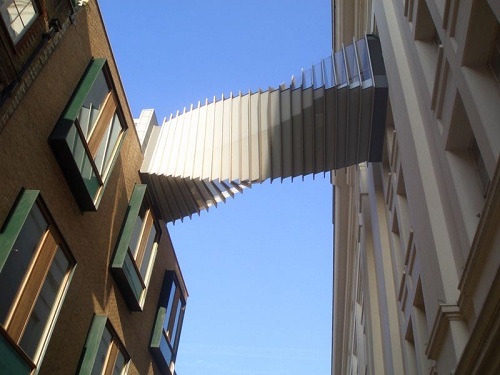 Convent Garden Skybridge is from far the most creative and orginal of the one i have seen so far. A few similar are visible in Paris as well near “grands Boulevards” but unfortnately I do not remember the exact street name.